What Exactly is Company Culture? - Need a New Gig? If you have been looking for a job in the past few years or have worked with a recruiter I am guessing that you may have heard something along these lines. “Culture fit” has become many company’s “go-to” response when it comes to passing on candidates. It is sometimes tough to hear, because there is no real feedback that comes along with it. They are basically saying that you don’t fit in with that company’s culture. What exactly does that mean? 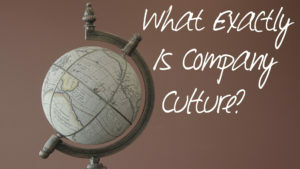 What is company culture? Does it matter? When organizations look to hire they try to find candidates that fit into their current mold. For example, a fast paced, high growth, open spaced technology firm would not look to hire the closed door, traditional employee. Instead they would try to find an out of the box thinker, that moves fast, who likes an open environment. Honestly, yes. Company culture is very important. Research has shown that employees are more likely to enjoy their time at a company if they “fit” in. They also tend to be more successful if they are around others who share the same values and interests. They typically build stronger relationships which results in greater performance. If we look on the other side of the fence it can be very different. If you do not “fit” in with your organization you are likely to be less productive. A good example is that if you are a strong team player and are a part of an organization that focuses on independent work, you will not reach your full potential. You will also be unhappy in the situation which can make you even less productive. Company culture doesn’t just benefit the employee, but it also benefits the employer. If they hire the right people not only will they get higher productivity, but they also tend to stay with the organization longer. So How Can You Fit In? You can’t. You should never take a position with the idea in mind that you will adapt to a company’s culture. Chances are that if you go down this road, you will be looking for a new position sooner than later. It is important to remember that you should never just take a job to take a job. Since we spend so many hours a week working, you want to make sure that you are going to be comfortable and actually enjoy what you are doing! The bottom line is that we are all different. The good news is that there is a company culture out there for everyone. You just have to find it. Take a look at our piece called Am I a Cultural Fit? This will give you some great insight on what you can do to learn about a company’s culture. We provide some solid advice on things you can do before, during, and after an interview to ensure it is the right fit for you! This entry was posted in Uncategorized and tagged company culture, culture fit, interview, Job Search, jobseeker. Bookmark the permalink. ← Friday Forum – Submitted a Resume With a Typo? !